One of the biggest changes in Search Engines in 2011 is the continually tweaking of search algorithms to create relevance and personalization for their users. But does this narrow our world view? And what does this mean for optimizing your web site? Before the digital revolution, content sent to mass audiences was filtered by gatekeepers – newspaper editors, television programming departments, radio executives, and book publishers. But the internet removed these gatekeepers, and it has only been recently that the internet audience has shown the fatigue of having too much data on hand. Enter the Search Engines. In an effort to meet consumer expectations and to help combat content fatigue, Google and other search engines began a process of personalization – using viewing history, comments, and other digital material such as likes and follows – to try and tailor search results to match a consumer’s expectations. Tied closely to this is localization – using your IP address to givegreater relevance to results closer to your geographical location. As you can see, this can become an issue quite quickly for businesses, especially start-ups and small business that have to break through the filter bubble to reach new customers. In health care, it could prove a challenge for public awareness and health campaigns trying to reach audiences with strongly held views or communities built around a behavior or practice that is trying to be changed or influenced. For web developers, this creates a real issue for tweaking SEO. Two individuals looking at the same search term in Google can get radically different search results, dependent on their Filter Bubble. When I look up issues related to Web Accessibility and Social Media tools, my results often pull up the blogs of friends and colleagues I have in higher education who have written on the subject. But if someone else was to perform the same search, those blog posts would be much lower in rankings – sometimes on entirely different pages of search results. As you can imagine, this can lead to a lot of confusion, especially when you, as the web content editor, are discussing the search engine placement of your site with an individual by email or phone. They might see a problem with the site’s ranking that you cannot; to you, your site is number one in search results, while in reality it might be a very different picture. It is essential to know this and understand the effect so you can communicate this to your clients and administrators of a department. 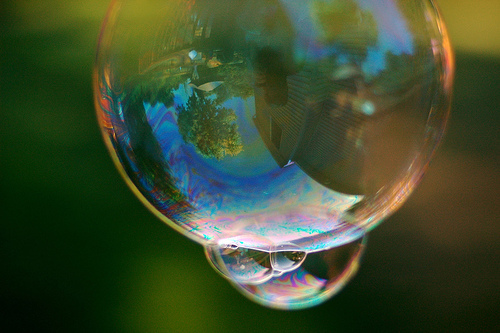 How do you Account for the Filter Bubble? Last Month, Google introduced a new search tool called Verbatim. The Verbatim tool ignores the spelling auto-correcting tool, the synonyms tool, and, most importantly, your personalized filters to give you the unadulterated results of exactly what you typed. It’s the cleanest unskewed search result you can get from Google. 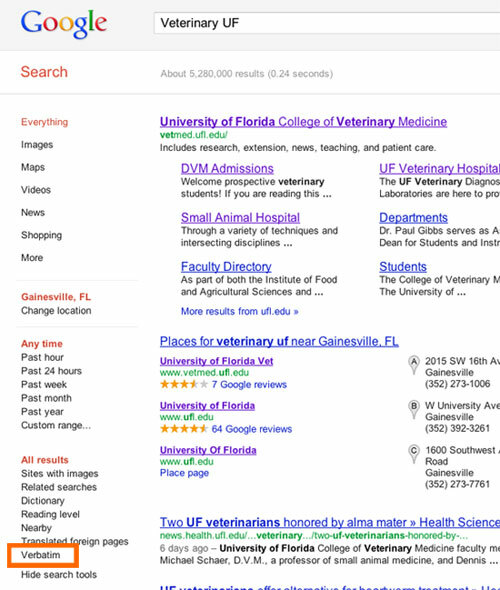 To use Verbatim, type in your search as you normally would using the Google home page. On the results page, select Show search tools at the bottom of the left hand column. Verbatim will be the last option on the Search tools list. Click it and the search results will be modified to remove Google’s influences on the results. There’s no sure-fire way to do this, but the following are practices to follow to help keep the filter bubble from skewing your results. Doing so will affect your web browsing preferences and experience, so use only those you are comfortable with. You can account for localization bias in searching Google using one the country-specific Googles [i.e. use google.co.uk instead of google.com] or by changing location with the left sidebar tools to specify a different U.S. city or zip code.